The MT has voted to issue a 1st degree penalty for draw refusal to Flying_Dutchman. Pending administrative action, 13 system points will be deducted from Flying_Dutchman and 13 points will be restored to njphillips12. Then, 50 points will also be subtracted from the Flying Dutchman's rating for the 1st degree draw refusal violation and he will be sent a warning letter. Progress in the game after a draw request has been refused will nullify the draw request(s) made before the evolution of the game occurred. That said, progress needs to be visible and within a reasonable time. There has been debate within the MT about whether to allow 10 minutes in every case or go with the plaintiff before that time if it looks like the draw refuser is not attempting to move the game along. There has been a tendency in the voting to go with the latter. So make sure you are clearly building something in the next minutes after you decide to refuse a draw. Just because a draw is requested does not mean that it's a draw. But it does mean that the onus to advance the game is now on the draw refuser. Also, a further note. Progress has to be real. A draw refuser may not offer up an unimportant piece in a token attack merely to extend the ten minute clock. A further note yet. 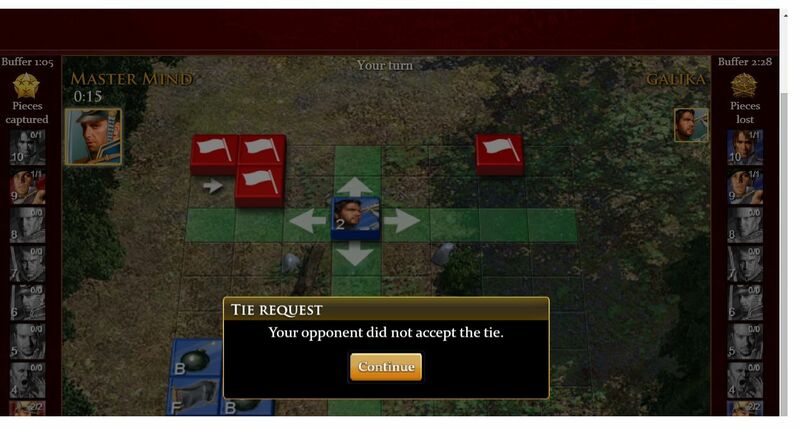 No one is obligated to offer a tie request, only to accept one if they cannot advance the game. If system tie requests have been exhausted, a draw request may be asked for in the BattleChat. It is not preferred to do this, but it will definitely be looked at by the MT. System draw offers run out after three attempts, barring a disconnect which will give three more. But if the situation is a clear draw and you can show that the game has run past all draw refusals, then ask for a draw in BattleChat. It is not preferred due to language difficulties, but a draw request made this way will be looked at by the MT. If you are in a no-win situation you can always exit the game this way without spending all day or night in it. Just make sure you can show the situation is a draw and that you've asked your opponent twice, ten minutes apart. If we agree, you'll get your points back and the other guy will lose his plus get a 50 point hit for draw refusal besides. I've played Robert E Lee before. he is a QA draw refuser I met before I knew of the forums. The MT will open a case for you, sevenseas. 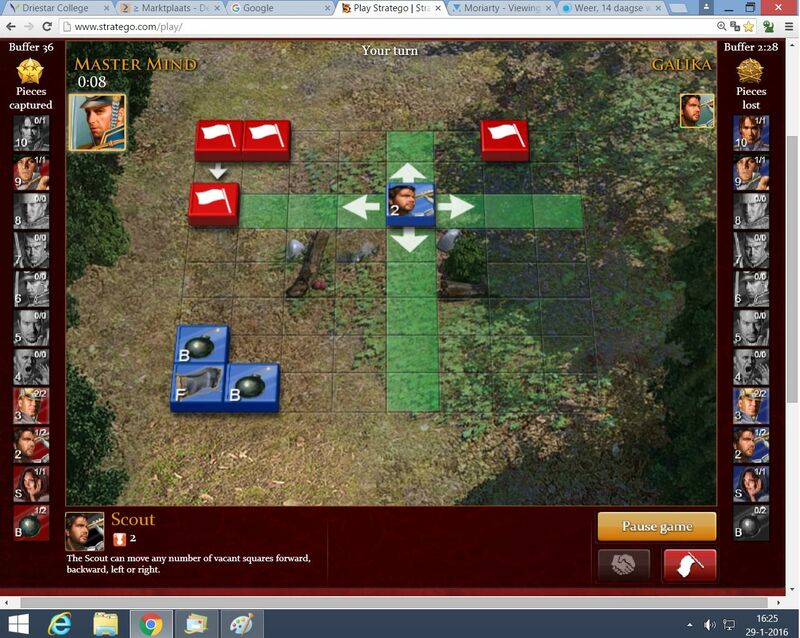 The MT has voted to issue a 1st degree penalty to Robert_E_Lee for draw refusal in his game versus sevenseas. Pending administrative action, 13 points will be deducted from Robert_E_Lee and 13 points will be restored to sevenseas. Then, 50 points will also be subtracted from the Robert_E_Lee 's rating for the 1st degree draw refusal violation and he will be sent a warning letter. I have another draw refusal case, this time against the player "sultan61"
The MT has opened a case for this match also . The MT has voted to issue a 1st degree penalty to Elvis 21 for draw refusal in his game versus Obiram. Pending administrative action, 13 points will be deducted from Elvis 21 and 13 points will be restored to Obiram. Then, a 50 point draw refusal penalty will also be subtracted from the rating of Elvis 21 and he will be sent a warning letter. Is this a change? Didn't it use to be a -50 instead of a -63? Thanks for asking, astros. Yes, it used to be a -50 only in the verdicts the MT issued, but because this did not take into account the undeserved 13 points that the draw refuser always gained when his opponent surrendered, we decided late last fall to begin recognizing this shortcoming in the previous punishments. What before was really an actual penalty of only 37 points to the draw refuser (50-13), is now a true 50 point penalty because the ill-gotten 13 points is corrected as well. The effect is indeed a -63 total on the draw refuser but we find it clearer to express the two numbers separately. Maybe that will change one of these days. The MT has always restored 13 points to the plaintiff in draw refusal cases, acknowledging the one half of the event as it were. But we'd never recognized the other half of the fact that those same 13 points were unfairly going to the draw refuser each and every time. In case anyone is wondering. 13 points represents the difference between a loss and a draw for the plaintiff (no matter the situation of the players), but it ALSO represents the difference between a draw and a win for the draw refuser. Hence we correct, or balance, that number of points on both sides. Then we issue a draw refusal penalty. Hope this explains the change. Thanks again for asking, astros. Yesterday, I played a very stubborn guy. He had an open flag with 2 and 10, and I only had a 2. My flag was closed. Edited by Master Mind, 30 January 2016 - 08:00 AM. 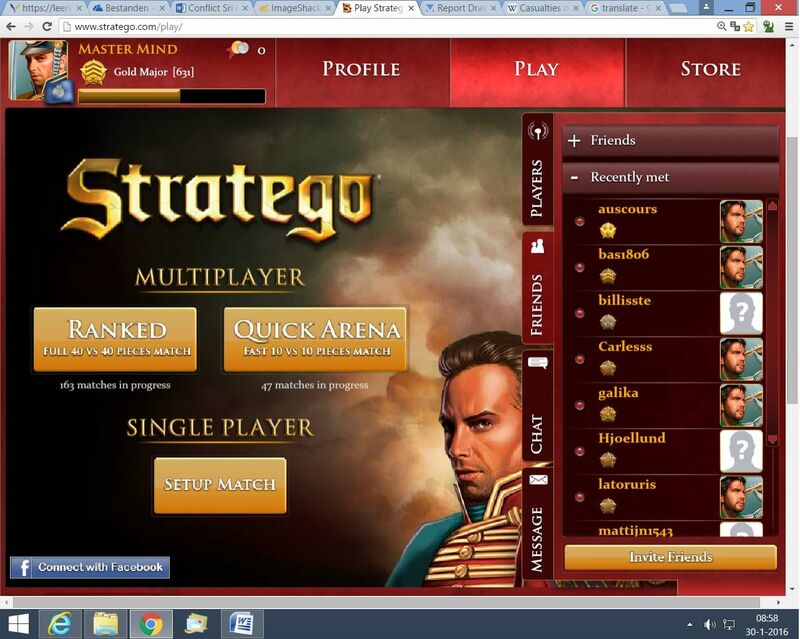 Yesterday, I played a very stubborn goy,. MM, do you have any more screenshots? Two that you show have the time but not the third one. Further, there is only 2 minutes of time between the ones shown. Yes, I'm sorry for that second screenshot. I minimalised it a bit, because I thought, it would be less KB. But then I registered at ImageShack, and now I can upload all pictures I want. I don't have more screenshots. Edited by Master Mind, 30 January 2016 - 09:00 AM. I am playing currently a game against a very stuborn player who doesn't accept the ties. Could you please stop the game, I'd like to have a break, he has been doing that for 1 hour. Edit 2 : He did read that and found that funny .. Please, just ban him ..
Edited by AzorAhai, 30 January 2016 - 12:19 PM. you need to ask him for draw and take screenshot of it. Then if it continues like this for another 10 minutes take another screenshot . 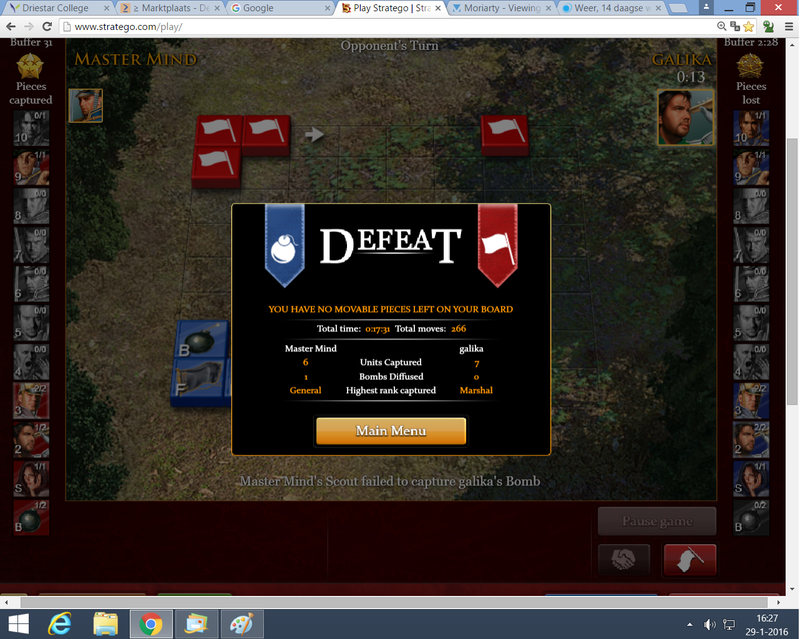 Then you can surrender and take a screenshot of your defeat screen. Then post all of them here. MT will then open a case for you. So I'm supposed to surrender after having waited 1 hour ? He drew after 1 hour of moving the same three units. I just hope you do something to punish him. you can read our rules for those cases. If you have enough evidence that there was no game evolution for 10 minutes after a draw refusal you can surrender and report here. If the case is valid you will get back your points.